High power stone impact crusher machine can deal with side length less than 500 mm, less than 350Mpa compressive strength of all kinds of coarse, medium and fine materials (granite, limestone, concrete, etc. ), widely used in all kinds of ore crushing, railway, highway and construction industry. High power stone impact crusher machine shows incomparable performance in primary, secondary and tertiary crushing and recycling applications. 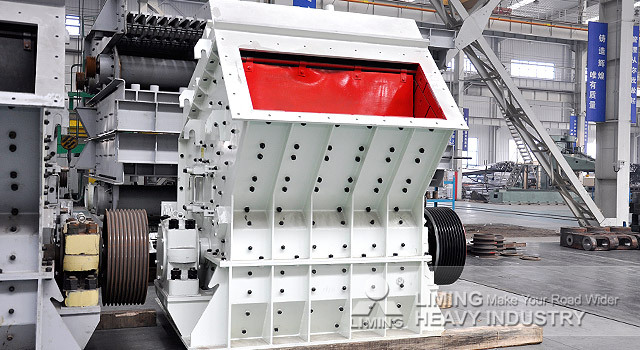 High power stone impact crusher crushes material by striking energy.when it works,the motor drives the rotor rotate at a high speed,on which the blow bar is installed .as soon as the material get into the affecting area of the blow bar,they will be stroke by the blow bar and be thrown to the impact devices around the rotor.the high speed forces the material to rebound from the impact liner to the area where the blow bar effects until they have been crushed to the required size.the clearance between the impact rack and the rotor can be adjusted to change the size and shape of the end product. High power stone impact crusher machine is exported to more than 130 countries and districts all over the world. If you are interested in high power stone impact crusher, please contact with our online customer service or leave a message.